As motoring pundits we often try not to get too personal with a car and for the most part, that holds up. And though the sphere of 'motor journalists' expanded the last couple of years with the inclusion of Instagram and other social media platforms, the traditionalists' stick to their guns and report on vehicles with truth and objection. The inclusion of social influencers, as they’re known, is very often associated with beautiful words that automakers will love. They're an extension of the automakers' PR and marketing teams and the beautifully crafted words are very often recycled for a next vehicle. And the motor journalist? Well, we try to be as objective as possible by giving a just review; devoid of 'PR talk' and the need for wanting to be 'liked'. But sometimes we review a car that, by all intends and purposes, is truly good at what it does. No fancy gimmicks to win you over, no upmarket vocabulary needed to describe it. Just a car that excels in its purpose. The ES is one of three sedans Lexus offers in South Africa and this 250 is one of two cars in the ES range; the other being the 300 hybrid. The ES 250 is not afraid to tackle the market head on. It offers a good, value-for-money package (very important!) that can’t be overlooked. At R593 300 it is one of the gems sitting on the right side of R500k, yet it warrants its position time and again. Coming in as the entry-level car to Lexus’ sedans, the ES 250 is quite big; to start off with. It measures nearly 5m in length and is 1.8m wide. The dimensions of the car are large and it is supported by a weight of 1660kg. It is by no means light, but Lexus managed to do enough to mask, and hide, the size when pushing on. It is further supported by an engaging design that has onlookers fixing their eyes on it. Though it does not have an exuberant design that screams for attention, the sedated look and oversized grille does enough to demand respect on the road. Funny enough, a few "Ben10s" in their spruced up Citi Golfs wanted a reaction out of me, but I wasn’t keen on having this car feature on some Instagram drag race. Not on my watch. Low and behold, one of the grandest and most beautifully crafted interiors you’d find anywhere. No really: you don’t have to be a social influencer to use such words, because it’s the truth. Lexus pulled no punches when constructing this interior and adorned it with leather, soft-touch materials and panels, electric seats, and space. Room enough for five adults and their bulky bodies. The steering wheel plays home to cruise control and buttons to control the on-board computer and media devices. In front of the driver is an instrument cluster that is very easy to read, and to your left, in the middle of the centre console, is an even larger screen from which you can access more technologies and features. Lexus even added a sunroof to the package to just enhance that premium feel. In a bid to maintain my credibility and not just sprinkle beautifully crafted words on a really impressive car, I have to point out that the rear seats do not fold down. The boot is a generous 420L in size, but cannot expand because of the aforementioned. Of course, it’s highly probable that your average ES owner will have a bakkie or SUV, too. Another, and final, issue with the interior is the touchpad used to control the centrally mounted screen. The device is similar to what you’d find in a laptop, but use thereof can be a bit sensitive. Though Lexus did improve the usability of the touchpad and decreased its sensitivity, right-handed users may find this a touch uncomfortable. You do get used to it, but it takes time. The ES 250 EX is adorned with an utterly amazing ride quality that could challenge the best of the super sedans. Granted, there is some wind noise and the 17-inch tyres can be heard whispering to the road, but nothing serious that will irk you up the wrong way. The front-wheel driven ES is powered by a 2.5-litre petrol engine and is power sent to the wheels via a CVT gearbox. The 152kW and 243Nm of torque is channelled in a smooth manner, but the lack of turbocharger can be felt. Because of the weight, the engine needs to be spooled up before the power kicks in, and did I find it best to drive the car as if going to church. Driving modes, such as Normal, Eco, and Sport, do add their respective traits to the drive, but the differences between them are not very impactful. A serious qualm about the gearbox is that even though a CVT ‘box has only one linear gear with artificial gears added in, the unit in the ES 250 is not very truthful in its operation. When changing gears manually, from fifth for instance, and engine revolutions are at a set speed, the on-board computer will show that gears six, seven and eight have been engaged, but engine revolutions will not drop and climb; as we’ve come to expect when gears are changed. If you read or saw a video of some influencer telling you that the gearbox is the best, remember the above. Don’t get me wrong: the ‘box does wonders at lower speeds and when accelerating sedately, but it’s far from amazing. The Lexus ES 250 EX is a brilliant car. Done. I can forgive the gearbox, because the car makes up more than for it in its drive. I can forgive the lack of a turbocharger, because there is adequate punch from the engine when needed. I can overlook the not-so-sensitive-anymore touchpad, because I’m seated in the lap of luxury. There are plenty of cars to be had for under R600 000, but you’d really have to look hard to find something as special as this. To find something as well-kitted as the Lexus ES 250 EX. Charlen Raymond is the editor of Manskap. 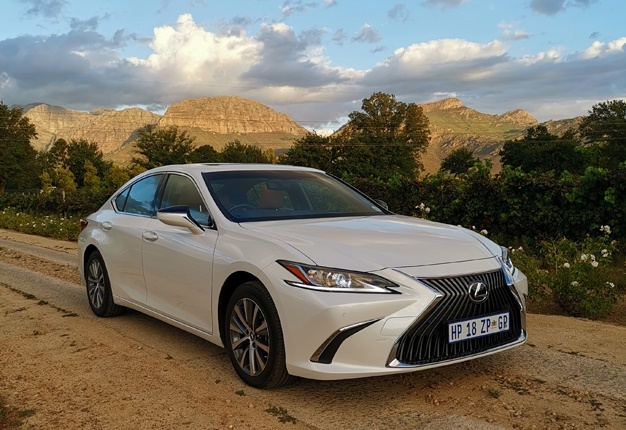 Wheels24's Janine Van der Post says: The Lexus ES was one of the 12 finalists in the 2019 AutoTrader SA Car of the Year competition recently. The automaker is known for its attention to detail and craftsmanship when it comes to building cars. The ES 250 is a strong rival in its segment, and also made for a strong competitor in the competition. Driving it is as smooth as sailing into paradise; it's lush and superbly comfortable. It holds its own on the track, but that facia on the console feels a bit outdated, despite the luxurious trimmings and inserts. With all of that said though, it's still a striking vehicle. Using it as a daily drive in horrible Cape Town peak hour traffic makes you feel like you're floating. It's just ridiculously comfortable. Put it in cruise control on the highway and you're set for a delectable drive. I sampled the 300h on test and I just love the silent hybrid technology of the vehicle. You can creep around on the electric motor up to 40km/h, making it perfect for traffic conditions and resulting in using no fuel at all. The CVT gearbox in the 250 might become a bit whiny, but the ES is not he kind of car you want to go chasing in. It's built for comfort and leisure, and it's packed with standard bells and whistles.